This salad is an old pal of our family. I’ve made this countless times. I’m not a person who loves salads. My hubby loves it. So, this goes with him at least once in a week as office lunch. It’s light and healthy. I’ve experimented with many ingredients for this salad. 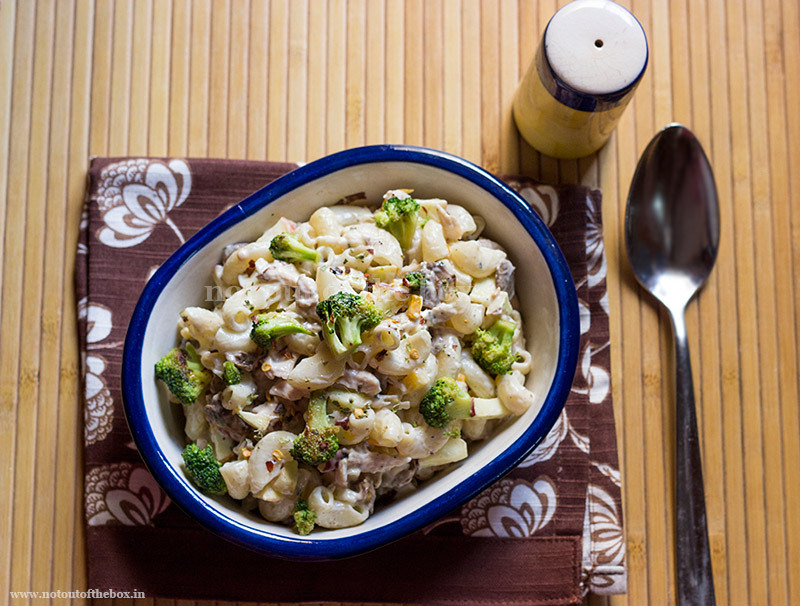 Sharing the best version what I like most, when it comes to make Macaroni salad. It’s a kid-friendly food. 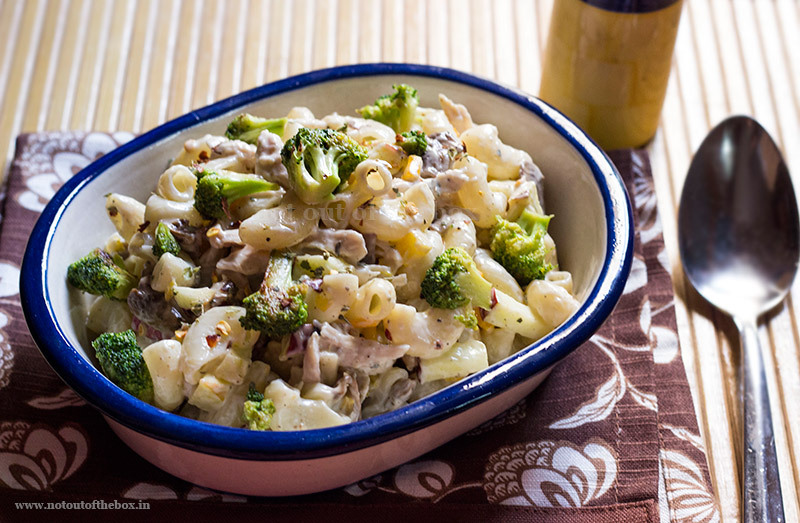 Kids love macaroni in any form, isn’t it? Give them this salad as school tiffin, they will love it. 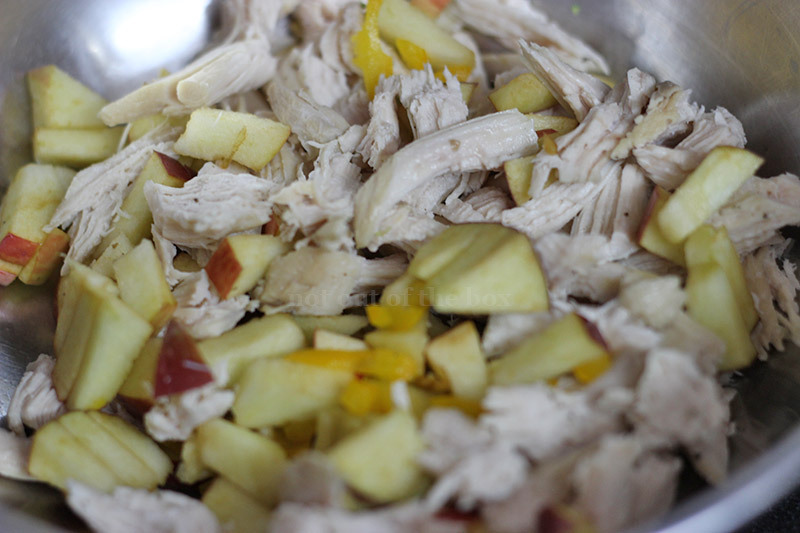 In a cooker add chicken Brest piece with salt and ¼ tsp of black pepper powder. Add water just to level the breast piece. Take off the flame after 2 whistles. Open the lid after the pressure has reduced. Take out the breast piece, let it be cooled little bit. Keep the stock, you can use the stock for making soups, or it can be added into chicken curries. Boil macaroni with few drops of olive oil and little salt. Check when done. Strain and wash under running cold water. Keep aside. In a frying pan (nonstick preferably) add 1 tsp oil. Add the broccoli florets and a pinch of salt, sauté them on medium flame for 5 minutes. Remove and keep aside. Now add 1 tsp oil again. 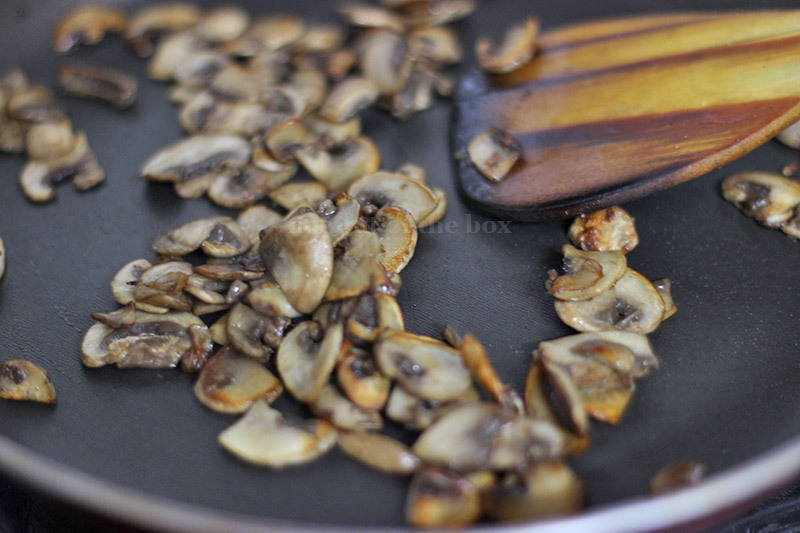 Add the mushroom slices with little salt and sauté them on medium flame for 3-4 minutes or until all the water releasing from mushroom evaporates and they turned out light brown in color. Remove and keep aside. Take a large bowl. 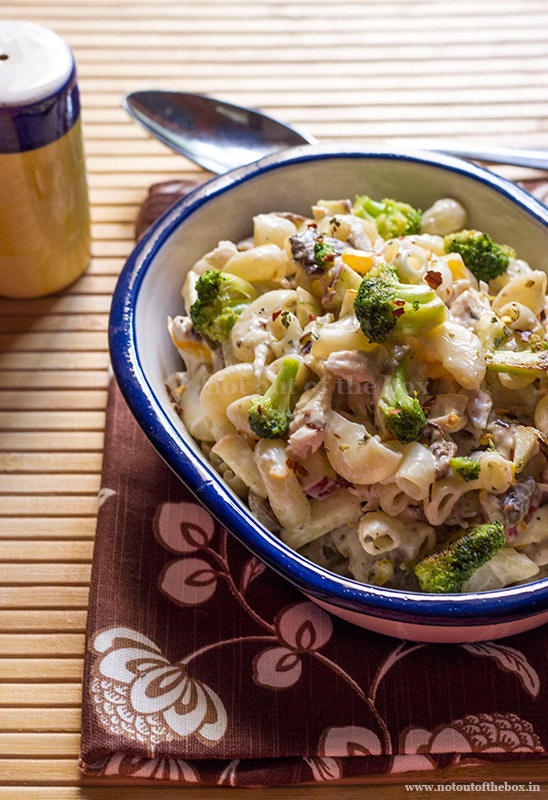 Add boiled macaroni, chopped apples, bell peppers, broccoli florets and sliced mushrooms. Tear the boiled chicken breast piece into small pieces using your fingers, or you can chop it into pieces using a knife. Do whatever suits you; now add these pieces into the mixing bowl. Add in mayonnaise, black salt, oregano, chilli flakes and black pepper powder. Mix well. Your salad is ready to eat. This can be made ahead; if you are planning for a party then it can be stored in refrigerator. You can serve this as starter or it can be a healthy breakfast option. This can be served or consumed any time in a day. It’s a versatile salad. Just go wild with the ingredients. You can add anything into this. Replace chicken with lightly sautéed cottage cheese cubes (paneer) for a vegetarian version. Love this gorgeous lighting Chandrima!